I make this dish at least once a week, without fail. It is so easy, tastes amazing, and I don’t have to go out and buy a bunch of random ingredients, since I usually have all of these things on hand (and I recommend you do the same)! The great thing about this dish is that you can add, subtract, and transform it as much as you like. If you want to make it spicy, add some chili flakes, if you happen to be going to the store, grab some extra veggies like onions, bell peppers, carrots, or peas, replace the rice with rice noodles, etc. The possibilities are endless! Start by heating oil over medium-high heat in a large wok (or skillet). Meanwhile, cut tofu into small cubes about 3/4 inch long. Sprinkle garlic powder, salt, pepper, and cilantro evenly over the tofu to coat it. Once oil is hot, place all the tofu cubes in the wok. Sautee, flipping occasionally to make sure all sides get golden brown and crispy. Once tofu looks golden brown, add in about 1/3 of the soy sauce and lower the heat to medium-low. Stir for a minute or two to coat and let the tofu absorb the soy sauce flavor very well. Add in the garlic, broccoli, and edamame, and stir to mix. Then add in the remaining soy sauce and peanut butter. Stir to coat well until the peanut butter melts to mix with the soy sauce. Last, add in the rice. Stir well and continue to sautee until rice absorbs the remaining sauce. Do a taste test here, and add additional soy sauce if necessary. Remove wok from heat. Scoop each serving into a bowl, and top with crushed peanuts and 1-2 slices of lime. Squeeze fresh lime juice into stir fry as desired. 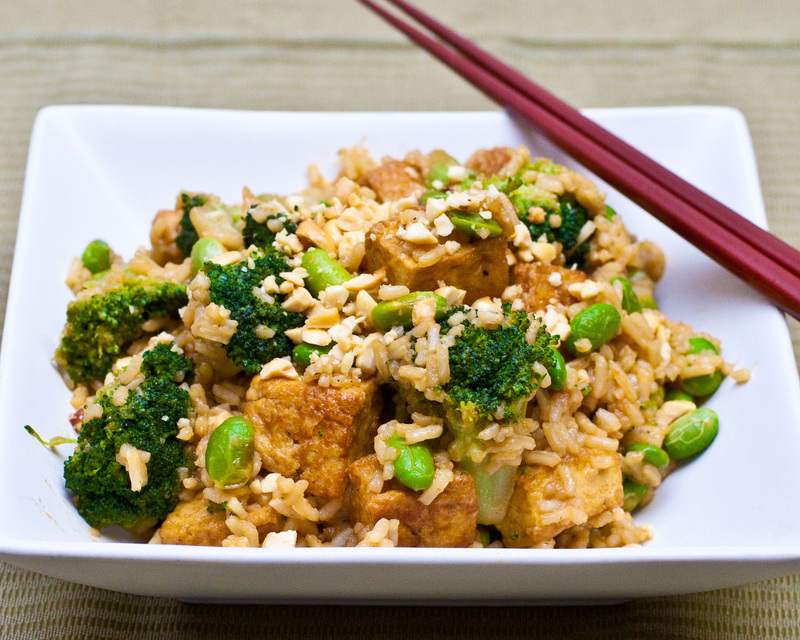 Enjoy this easy, delicious, vegan & gluten-free meal! I can attest that this dish is awesome! This is the most beautiful dish. I think it needs something red in it, just because I like lots of colors in my food. You could try including some authentic Thai peppers, but I don`t think most non-asians can handle too much of that, as it is spicy in a very different way than the hot peppers of the Americas that the rest of the world is accustomed to. I also love the picture at the top of the troll hair. Cute logo! Thanks!! And I completely agree…green vegetables are all my favorite so I tend to overload on those! I don’t think I’ve tried Thai peppers before, but I may just go with some red bell peppers next time. And who doesn`t love quirky?! ?